If you live in the Fairview Heights, Illinois area and the roof on your home is no longer doing its job or has recently suffered storm damage, Daech & Bauer Roofing can help. We have decades of residential roofing experience and can repair or replace your roof to ensure your home is protected for years to come. With more than 10,000 successful projects completed to date, we’re confident that we have the skill and expertise to do your roofing job right. At Daech & Bauer Roofing, our commitment to our customers helps us stand above the competition. With our “apples to apples” guarantee, we promise to match any competitor in the Fairview Heights, IL area that offers the same work – using comparable materials – for less. We also back our work with a five-year labor warranty to provide our customers with additional peace of mind, and we are on standby 24 hours a day in case a leak appears and emergency repairs are needed. Another factor that has helped us become a residential roofing leader is our commitment to the Owens Corning™ Total Protection Roofing System®. 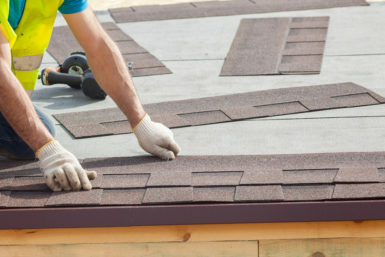 This is a comprehensive process that ensures that the new roof on your home will be able to withstand severe weather while also providing adequate attic ventilation. This can reduce heat transfer between your home and your attic, potentially reducing your energy usage. If you would like to learn more about our residential roofing services or schedule an appointment, contact Daech & Bauer Roofing today.